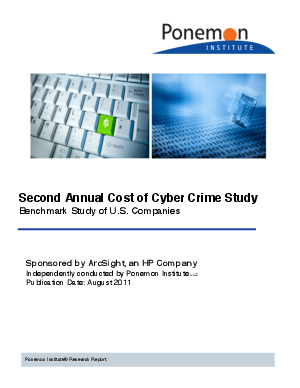 Results from the Second Annual Cost of Cyber Crime Study, sponsored by ArcSight and independently conducted by the Ponemon Institute, clearly illustrate that despite increased awareness of the impact of cybercrime, cyber attacks continue to occur frequently and result in serious financial consequences for businesses and government institutions. Companies participating in the study experienced 72 successful attacks per week, an increase of nearly 45 percent from last year. The study also revealed that the median annualized cost of cyber crime incurred by these organizations increased by 56 percent to $5.9 million per year.